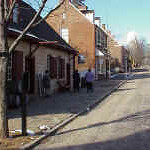 The day began with tours of Old Salem in the historic section of Winston-Salem surrounding Salem College. 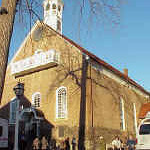 Moravians settled in the area in the late 1700s and founded Salem, which joined Winston in 1913 to form Winston-Salem, N.C.
Lutheran-Moravian full communion was honored Jan. 27 at Home Moravian Church, Winston-Salem, with an afternoon panel discussion and a lovefeast. 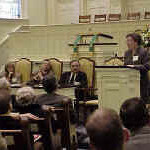 Moravian and Lutheran influences in U.S. history were explored by (left to right) Dr. Susan W. McArver, Lutheran Theological Southern Seminary, Columbia, S.C.; Dr. Gary Freeze, Catawba College, Salisbury, N.C.; Dr. C. Daniel Crews, Moravian Archives, Winston-Salem, N.C.; and (standing) Dr. Nola Reed Knouse, Moravian Music Foundation, Winston-Salem, N.C. The Rev. 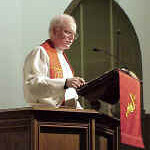 Leonard H. Bolick, bishop of the ELCA's North Carolina Synod, delivered a sermon during a late afternoon Moravian "lovefeast" at Home Church. He identified the new Lutheran-Moravian relationship with a marriage proposal he overheard recently in a restaurant. The lovefeast combined music, prayer and Scripture readings with the sharing of a simple meal. 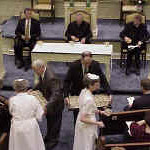 Servers or dieners gave each person in the congregations a roll made of sweet bread and a cup of coffee, specially brewed with cream and sugar, to enjoy as a sign of fellowship. 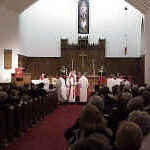 Lutherans and Moravians completed the Jan. 27 celebration of full communion with the Lord's Supper at Augsburg Lutheran Church, Winston-Salem. Joint worship and the sharing of the sacraments are part of the full communion agreement. The Rev. 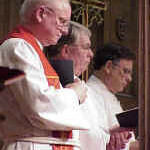 Lane A. Sapp (center), pastor of Calvary Moravian Church, Winston-Salem, presided during the Eucharist. 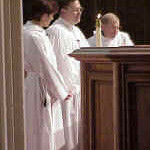 He is assisted by Myrna J. Sheie (left), executive assistant to the bishop of the ELCA, and by the Rev. Paul R. Nelson, ELCA director for worship, Division for Congregational Ministries. The Rev. 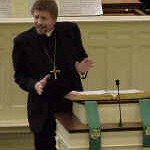 H. George Anderson, presiding bishop of the ELCA, Chicago; the Rev. R. Burke Johnson, president of the Provincial Elders' Conference of the Moravian Church, Northern Province, Bethlehem, Pa.; and the Rev. Robert E. Sawyer, president of the Provincial Elders' Conference of the Moravian Church, Southern Province, Winston-Salem, (left to right) opened the worship service. Bishop Anderson based the evening's sermon on a common Moravian theme -- Christ, the Good Shepherd. "Jesus knows us, and yet he loves us," he said. "He still lays down his life for us."